Watch Dogs PS4 & Xbox One: "Identical in Almost Every Way"
Watch Dogs animation director Colin Graham says the two versions are practically the same. Xbox One users may have been dismayed to learn that an increasing number of cross-platform games run at higher resolutions or framerates on the rival PlayStation 4. 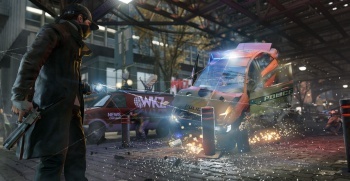 The fact that all of the gameplay footage we've seen from Ubisoft's Watch Dogs so far is from the PS4 version, has been worrying some that the Xbox One version would again get the shaft in terms of graphics, however, Watch Dogs animation director Colin Graham assures us that this is not the case. "It really doesn't look different though," Tweeted Graham, in response to a fan asking if we would ever see promotional footage of Watch Dogs running on the Xbox One. "The two versions are identical in almost every way," he added. He did, however, clarify that "On the technical side I cannot say, I just don't know," when asked if the games will have the same resolution and framerate. "I'm an Animator, not an engineer," he admitted, adding "To me they look the same." So, while it's not quite a 100% confirmation that the Xbox One version of the game won't be scaled back in some way, it's still looking good for Xbox owners. Watch Dogs has faced a rather lengthy delay from it's initial release date of November, 2013, but it has now been confirmed to be coming this spring. The delay meant that the team had time to better fine tune the game, and include some game systems that they were initially saving for a sequel. Which platform will you be getting Watch Dogs on?